I am still working on the sampler. Good grief, am I slow or what. I did cut off the 30 epi part and resley to 24 epi. I also re-threaded from 8 shafts to 16 because I had come up with my own little draft and figured I might as well try it out on the 24 epi sampler. Somewhere between creating the draft and re-threading, I forgot what I was planning and threaded a straight draw when I should have threaded a point draw. Nice job on the repair. It’s hard to see now so once it’s washed and pressed I would think it’ll be invisible. You have more patience than I do . . . This first time I did a needle repair was with thick wool at a set of 14epi. I thought, gee this isn’t too bad. 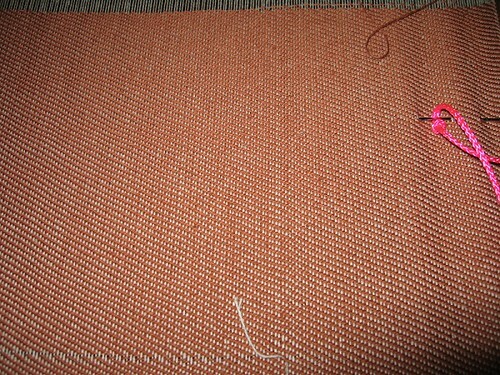 But now with finer threads it is very frustrating when you take the time to fix it and your fix still has mistakes. It is not an easy thing to do. Oh well. 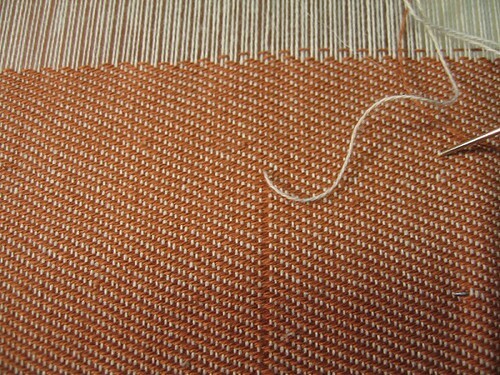 It was frustrating, and that was just a plain old twill. I don’t even want to think about repairing a more complicated pattern.